I’ve been putting off this post because I couldn’t think of a clever way to write it. I couldn’t think of a way, without writing a novel, to convey all that’s been going on here the last few months. Through a few posts over the next few weeks, I’ll try to catch everyone up to speed about the changes happening here at Compass Farms. There’s been a lot going on here behind the scenes the past few months. All the little changes- some you’ll notice, some you won’t- are all helping us work towards our big new adventure! The first thing that someone might have noticed because of this is the unavailability of our cheese. The past few years, we’ve done a lot of work promoting, selling, (and sampling!!) the cheese made from the milk from our herd of Jersey cows. We had it in a few retail locations, had a home-delivery service carrying it, and met a lot of great people at farm markets. There were a few reasons behind the decision to discontinue the cheese, but our next new adventure is the biggest reason. Carmen with the Jerseys, soon after we brought them all home. For the past year, we’ve had an employee who took great care of our Jersey herd. He cared for them as if they were his own, and we trusted him with the herd of cute, big brown eyed beauties. This young man had a great opportunity to start milking cows at his home farm, just about 20 miles north of us. Because of our transition, it just made perfect sense for us to sell our herd to him so he could move them to his home farm. It’s pretty bittersweet. We’ve only had the herd for a few years, but in that time, we came to love them, and were so proud of the healthy, happy herd we had put together. BUT, it was necessary that we didn’t have an extra herd of cows to care for, so all in all, it was a great fit- we know our cows are going to stay together as a herd, and we know someone who sincerely cares about our girls will be taking care of them. NERVOUSCITED. Nervous-excited. With two horse-crazy girls in the house, I’ve watched my share of My Little Pony. 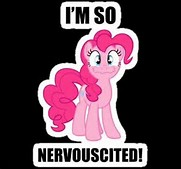 Pinky Pie was able to perfectly sum up how I’ve been feeling the last few months. So- there’s post number one about our changes! As we transition to our next step, we’ll keep you filled in. And if you’re disappointed about not being able to get your hands on our cheese anymore… don’t worry! If everything happens like we think it will, you’ll soon be able to get your hands on some more dairy-goodness from yours truly!